One of the bigots who used last night's ... whatever it was meant to be ... on ITV to call Nigel Farage a racist is a Labour-supporting "diversity" blogger who was invited onto the programme by ITV because of her black power podcasts. 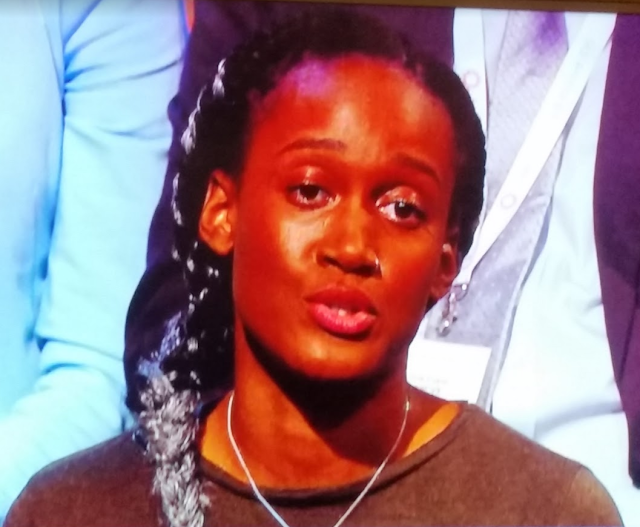 Imriel Morgan went on the EU referendum programme where she was supposed to ask a question about the EU referendum but instead spent her slot accusing Nigel Farage of being a racist complete with eye rolling petulance when she didn't like his answer. Ms Morgan is an accomplished self-publicist so I won't link to her many social media profiles or her Huffington Post profile but needless to say she's all about black power in the face of white oppression. She even faked "aggro" on Twitter last week using her own company's Twitter account because she wanted people to know she was sitting opposite Sadiq Khan on the tube. She's done pretty well from her outburst with an appearance on breakfast TV, radio and of course her friends at the Huffington Post now think she's a working class hero because she called that frightful beast Nigel Farage a racist. Meanwhile, her websites, company, podcasts and social media accounts are getting massive exposure.